In this article I’ll take a look at how commodity index funds have performed when compared to an investment in U.S. stocks. The equity benchmark I’ll use is the S&P 500 Total Return index, which measures the performance of the 500 largest U.S. stocks, including their dividends. 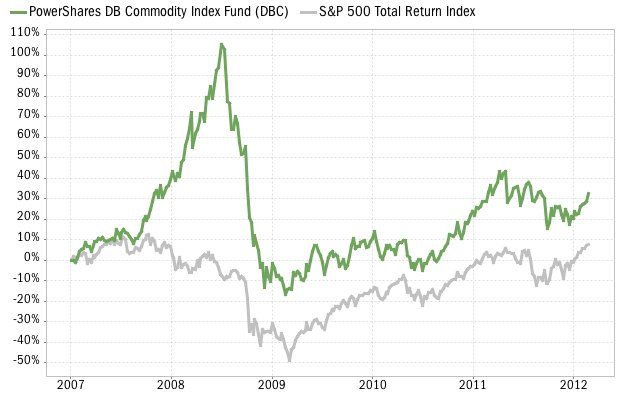 First up is the Powershares DB Commodity Index Fund (DBC), which was introduced in January 2007. It is currently the most popular commodity index fund, with 6.39 billion dollars under management, an annual expense ratio of 0.85% and average trading volume of 2.5 million shares per day. Between inception and its peak in mid 2008, the fund gained over 100% in value. But its subsequent decline of over 60 percent was more severe than that of stocks during the same period (the S&P 500 lost 55% of its peak value). Still, an investor in DBC would have fared better than a U.S. stock investor, as can be seen in the chart below. 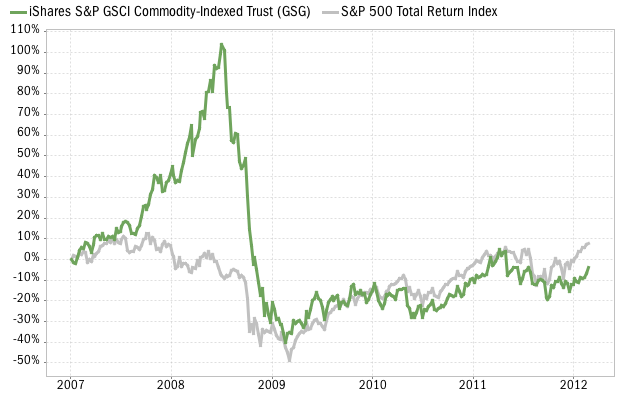 Commodities add some value as a means to diversify a portfolio. You can see this clearly in the above charts: both DBC and GSG continued to rally during the first half of 2008, long after the bear market in U.S. stocks had already started. In retrospect, part of this return appears to have been speculative investments by hedge funds and other players. Still, when risky assets started to be sold off across the board in the second half of 2008, commodity funds provided no shelter or buffering for an investor’s portfolio. In summary, by these measures you can see that commodities can certainly enjoy large gains during a short time period, but they are also riskier than large cap stocks, w.r.t. their volatility and maximum drawdown.